ESO’s Very Large Telescope, the flagship facility for European ground-based astronomy, celebrates its 20th anniversary today. The first of the VLT’s Unit Telescopes saw first light on 25 May 1998, ushering in a new era of astronomy. Over the following years three more 8.2-metre Unit Telescopes were completed and these giants were joined by the four smaller Auxiliary Telescopes (ATs) that form part of the VLT Interferometer. The interferometer first combined the light from two ATs in 2005, creating a virtual telescope up to 200 metres in diameter that now regularly observes the surfaces of stars. The VLT could not function without its world-class suite of instruments, which have been developed in collaboration with astronomers and engineers in the ESO community. 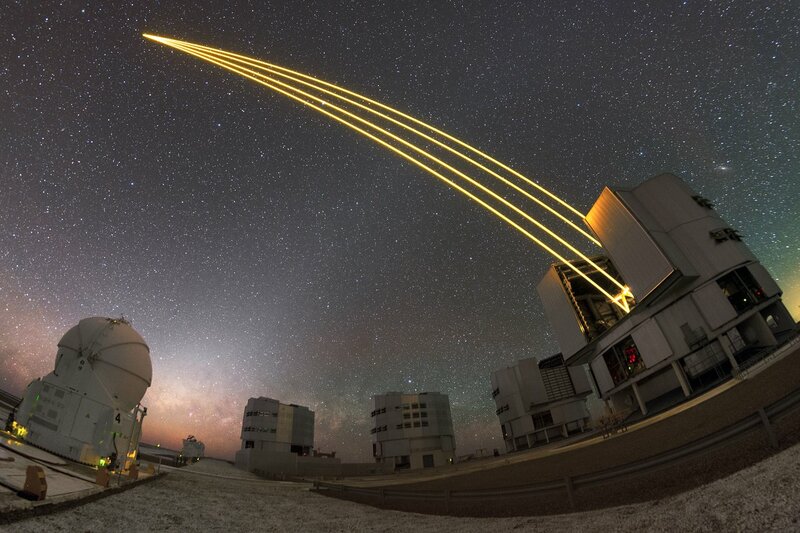 A spectacular recent addition to the VLT is the 4 Laser Guide Star Facility, which projects four 22-watt laser beams into the upper atmosphere to create artificial stars that help correct for the effects of atmospheric turbulence, a technique known as adaptive optics. The instruments on the VLT are in high demand — last year the requested observing time exceeded the available time by a factor of five. Successful observing requests have provided the data behind thousands of peer-reviewed scientific papers — in 2017 alone, over 600 papers were published using data from the VLT. ESO’s flagship observatory has not just led to a great quantity of science, but also quality. The VLT has contributed to breakthroughs in many areas of astronomy, and is responsible for seven of ESO’s Top 10 Astronomical Discoveries. For instance, in 2009 the VLT overcame the demanding observational challenge of imaging a planet around another star for the first time, followed by the first analysis of the atmosphere around a super-Earth exoplanet in 2010. ESO has continued to build on this planet-hunting capability with SPHERE, a planet-hunting instrument that was added to the VLT in 2014. Painstaking VLT observations spanning nearly two decades revealed the motions of stars orbiting the supermassive black hole at the centre of our galaxy. This continues to be a closely-studied topic — in fact, this week the VLT is scrutinising the star S2 as it passes close by this hidden monster. Just last year ESO’s fleet of telescopes, including the VLT, was used to observe another exotic phenomenon: the first light from a gravitational wave source. 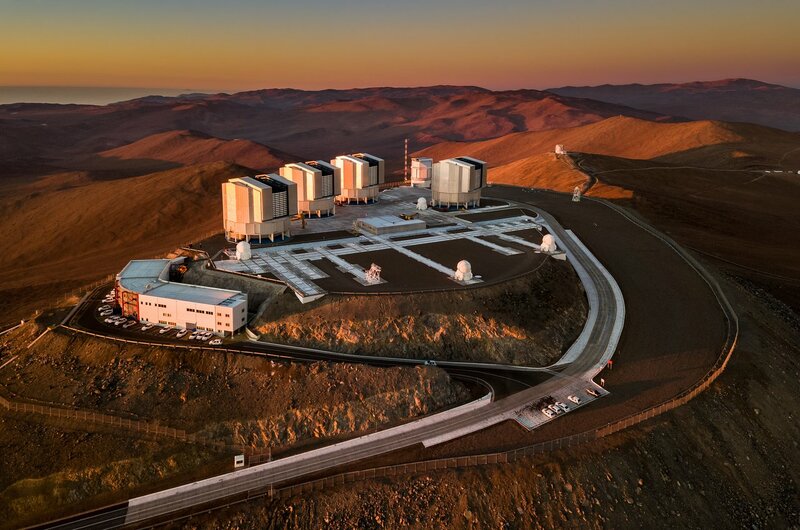 On top of its scientific legacy, the VLT is also playing a vital role in preparing technology for ESO’s Extremely Large Telescope (ELT), currently under construction 23 kilometres from the VLT in the Atacama Desert in northern Chile. ESO’s experience in building and operating remote, cutting-edge observatories such as the VLT is proving vital in developing the ELT, the next frontier in ground-based astronomy.